Having your hair and/or makeup professionally done isn't something most of us experience regularly - myself included! The process can be a little unnerving if you don't know what to expect, and you probably have a few questions. Having been on the side of providing those services to countless women, I wanted to make a quick list of things to know before you hire someone to do your hair and makeup to make it the best experience possible. You might have an artist in mind, whether they were recommended through a friend or someone you follow on Instagram. Or you might just finally have a reason to get your hair and makeup done, and you can't wait to book your artist! Either way, do a quick google search for a few options in your area, and compare websites. Things to look for are the artist's Portfolio (do you like the majority of the looks? ), up-to-date social media (are they active? ), and pricing, of course! Reach out to your number one first, and wait to hear back. If you don't hear back in a timely fashion, go ahead and send out your inquiry to your backup choices and go from there! This is not a general law, but know that the less you pay, the more likely the artist is just starting out and learning as they go, and you might have some communication speed bumps as a result. Of course, this is not always the case, and we all love a good deal! More seasoned artists set their prices higher because they are busy with active clients regularly, they invest in great products, and they have learned to communicate what women need to know. Their skills are sharpened, and this is likely their only job. Artists love nothing more than a client who tells us succinctly what they want (2-3 pinterest inspiration pictures, or a brief explanation) and what they don't (if there is a specific sensitive issue like to cover ears, or make their forehead look smaller) From there, it really helps us to hear some form of "I trust you!" We see a lot of faces, skin types, hair types, and shapes all the time, and we are able to make choices for you that maybe you wouldn't make for yourself - and that's a good thing! If you don't like something - please tell us. We just met you, and while we strive to listen to what you do and don't want, we still might do something you're not totally in love with, and it's no problem for us to tweak. It's better to tell us than to keep it to yourself, or worse, whisper something to someone nearby. We are human and feel insecure, too. The more comfortable and valued we feel, the better work we do for you! Though most on-site stylists come with their entire kit, a chair, an extension cord, and sometimes a table-like situation, we still need a few things from you. Access to an outlet, an additional table or counter, and natural light are super helpful for us! It helps if you clear us a little table space by a window if possible to save us some time. Our job is a little more difficult the more crammed a space is, so keep that in mind especially if you are hiring us for a wedding day where there are many individuals (and their belongings) involved! How long is it going to take? A seasoned artist should provide you with a timeline (especially where multiple services are involved, like a wedding day), and should let you know what time they will arrive, how long it will take them to set up, and how long each service should take. Each artist works at a different pace, but somewhere between 30 minutes to 1 hour per service is normal. Tip! Think about it as a salon experience, but an added benefit of the salon coming to you! Anything up to 20% per stylist is SO appreciated! If you have a lead stylist who brings along assistants, you can tip each stylist individually, or give all the tip to the lead and specify that the tip is for all the stylists. The lead will split accordingly! If your stylists show up late or ill-equipped to do their job well, or if their conversation or conduct is inappropriate, do NOT feel trapped into tipping! Hopefully you should have a feel of whether your stylist is tip-worthy before meeting in-person. If not, go ahead and find another stylist ASAP instead of getting a less than great experience! ...or Carrie Underwood or Blake Lively or Rachel McAdams. And that's a good thing! I love a good Pinterest inspiration, and that usually involves a few of the aforementioned celebs! Don't worry about including those if you really love an element of their look like their eyeshadow, lip color, or updo. Pick specifics about their look, instead of a "make me look like her!" attitude. In general, it is helpful to choose inspirations that have similar face shape, skin coloring, eye color, and hair type/color as you. Before meeting with your stylist, do a little skin and hair prep on your own! We recommend a hydrating face mask the evening before or the morning of (such as Garnier SkinActiv Moisture Bomb), a soothing eye mask the morning of (such as Juice Beauty Stem Cellular Eye Lift Algae Mask), and a nice moisturizer both the night before and morning of (like Fresh Vitamin Nectar Moisture Glow Face Cream) Prep your lips, too. It's hard for us to work with chapped lips, so use Aquaphor on your lips nightly leading up to your day (and the morning of!) We also like washed hair as opposed to the outdated "dirty hair is better" idea of the 90's! Just make sure it's 100% dry dry dry before you sit in our chair! We've got the products to get the hold we need. Other artists, do you have anything to add to this list? Comment below! 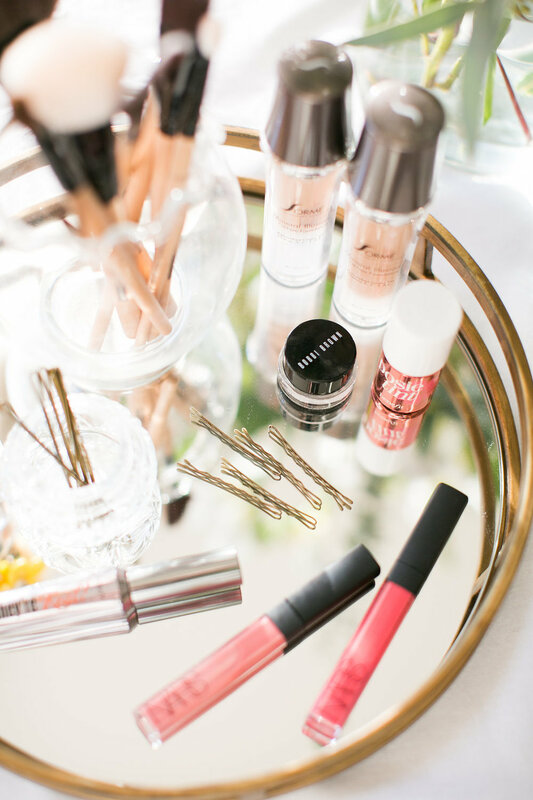 And ladies, what else do you have questions about for the best hair and makeup experience? I'll be sure to answer you! A new season is almost upon us, and with the change of weather comes daydreams of a fresh hairdo! I don't know about y'all, but I save up my money to get my hair cut and colored nicely once a year. Any time you see an image online, in a magazine, or of a friend, and you just love the cut and/or color - save those pictures! Pin it, cut it out, or save it to your camera roll. Even if you like a lot of different styles, save it. I recommend saving up your inspirations for several months, and then (before making your appointment) look over your inspi to see which cuts and colors you are seeing the most of. Notice a trend? But don't get weirdly scientific about it, ok? In general, if you're naturally very dark-haired, you probably won't be able to achieve platinum blonde (unless you can spend some serious time and cash!) If you've got super-curly hair, choose inspirations that include those natural curls instead of straight, sleek styles. If you've got thin hair, steer away from voluminous styles. Once you have an idea of the type of cut and color you are going for, start following local hairstylists on instagram and see if you can spot your desired cut and color on their profile (even if it's different pictures - one for the cut you want, one for the color you want). Stylists will post images of cuts and colors they like doing and are good at! Once you find your ideal stylist, check their salon website and start deciphering how much your services might cost. You'll see terms like Cut $45+, Balayage, Partial Balayage, Highlight/Foil, and Style. What does "+" mean?! Do I need balayage - what even is that?? Call the salon, and ask how much your desired stylist charges for a cut (their cost will depend on their experience and tenure at the salon). Then explain your color situation so the receptionist can help you decipher what kind of color service you might need. Do you have virgin (never been colored) hair? Is your hair already colored and you just need a spruce? They'll let you know if it will likely take a balayage treatment or foil treatment, partial or full, or an all over color (or a combo of any of these) - and you can plan accordingly. Once you have a ballpark of how much your services might cost, start saving up that $$$ to just go for it with your ideal stylist and your ideal look! It is worth it to not cut cost corners. And don't forget to add a 20% tip for your stylist! Have your tip prepared in cash to make the stylist and receptionist dance with joy and award you as the most wonderful client on planet earth. Popular stylists can book a couple months in advance, so go ahead and make your appointment when you know you'll have your budget ready! After all that planning, make sure you have ample time in your day to enjoy your services to the full. Most salons are crazy busy during the weekend, so if you can take a half-day or full day off of work, I advise you to go for a weekday. Grab a fancy cup of coffee to take with and play up that pampering experience! I recommend choosing 5-10 of your absolute fave inspies, and saving them to a separate Album on your phone. If you have an iPhone - make an album in your Photos called "cuts and colors" so they're all together and ready for your stylist, so she's not standing around waiting for you to pull up Pinterest or watching you scroll through your personal photos to find your hair pics. When they're all together, she'll be able to tell more easily what you really want, and how to make it work best with your hair/face/coloring. In addition to a fancy beverage, I also recommend bringing fun reading material, like a book you've been wanting to enjoy or a magazine (like The Magnolia Journal) that you wouldn't normally get for yourself. I like to enjoy a balance of chatting with my stylist and quiet me-time. For a cut and color, you could be there 2-3 hours, so live it up! What do y'all think? Was this helpful? Let me know!